When visiting Lisbon Airport Portela, you can book a per-hour car rental with driver from 2 hours/day and more. Meet and Greet service, offered by our company, will significantly simplify the meeting in the airport for the newcomers. Using a "car rental with driver" service you can vesit the places of interest, famous shops or outlets to do some shopping near the city, saving your time in this way. Lisbon Airport Portela chauffeur service offered by our company will cost you much cheaper to order a car rental with driver with us than to hire a taxi driver. To book the economy car or minivan with chauffeur or a comfortable premium class car, coach, shuttle bus up to 50 seats, please choose the button. Per hour rental in the left upper corner of the page, write in the [Departure:] field the departure point and number of hours. 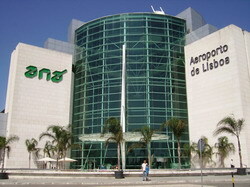 Lisbon Airport LIS that is called Portella is the largest Portuguese airport, located in the north of Portugal. How to get to the city? There is a red line subway that goes directly to the airport so the city center can be reached in just 16 minutes. You can go by minibuses that run every half an hour. A taxi service is demanded today, especially among the passengers with a heavy and bulky luggage, with children. However, for all its advantages tha taxi is quite expensive, so the desire to save by chosing a cheaper than a taxi way is rathe clear, but not at the expense of comfort on the trip. Your best option in this case is a transfer service from the airport to Lisbon booked from our company. We can offer you the high level quality service, the individual approach to each client, the acceptable price. Please feel free to contact us!